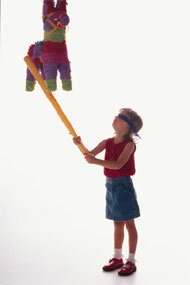 Learn How To Make A Pinata! You can make a pinata and save yourself a lot of money. This childrens craft is so much fun for them to make. They may need a little help from you but they can do a lot of the work. One important note is to be sure you tear and not cut the newspaper into strips. This increases absorption and the adhering properties. Make sure that you thoroughly saturate the paper in the paste. This is quite messy and with kids helping you need to make sure that your have the workspace covered. Use an old tablecloth or plastic cover. Be sure that you allow each layer of paper mache to dry completely before you add the next layer. This ensures the best possible hold and consistency. 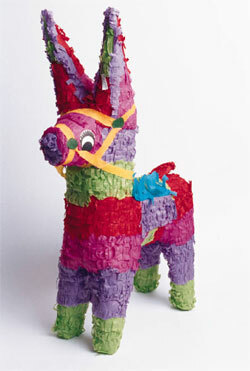 Items you will need to make a pinata. Make your paste with flour and water. Stir three parts water into one part flour until you have a smooth and creamy mixture. After you stir it all together properly the paste is ready. Now you are ready to start. Blow up the balloon, tie it and coat it in a thin layer of Vaseline. The Vaseline makes the balloon pull away from your piÃ±ata easier. Rip your paper into thin strips (narrower strips work best when using a rounded mold) and dip in the paste. As you lift the strip out, run it between your thumb and forefinger to squeeze out the excess paste. Drape the strip across your mold. Be sure to overlap your strips slightly as you go. The torn edges will blend together and your final product will have a much smoother finish. To make a pinata you will need more that one coating of paper. Be sure to let it dry before you apply the next coat. Put the next coat on in a different direction. This will make it stronger. If you feel that it needs more coats be sure you let it dry before applying. Once it is dry you can make it into your desired animal by using the tissue tubes and some newspaper strips. Stick the tubes on for the legs and one for the neck. Cover them in the newspaper to make them stronger and also keeps them from falling off. Scrunch up some newspaper into a ball for a head or any shape you need for the head of the animal. Stick the head on with some more newspaper. If you would like you can take crepe paper and cut into little strips and glue on to the shape. Most people just paint the animal whatever colors they like. Cut a hole in the belly of the animal and thread some string through the top for hanging. Tie the string to a piece of card on the inside so that the string doesnâ€™t pull through. Now fill with wrapped candies or small toys. Use sticky tape the put the piece your cut out back in place. There are so many different things that you can make with the paper mache. Just let the kids make bowls or mountains or flowers. They will have a ball with this kids craft. Kids can make a pinata for many different occasions. Just let them have fun!